In the Nanzen-ji Temple’s grounds, a few steps away from the Sanmon-gate is the Tenjuan Temple, which is a small sub-temple dedicated to the Zen master. The name Tenjuan 「天授庵 」 literarily means “Heaven Given”. Tenjuan Temple has a main hall, a study and two gardens, a rock garden featuring dry stones, moss, trees and geometric patterns and a stroll-style pond garden, which are both stunning in the spring and autumn. Visitors can enjoy the tranquility of the rock garden while sitting on a wooden porch and stroll the path around the pond in a lush garden. 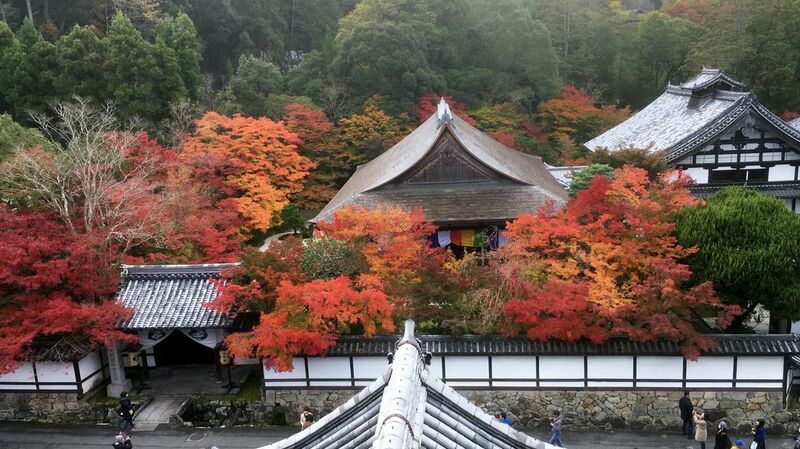 In Autumn, the garden is colored with brilliant red autumn leaves. It particularly attractive during autumn illumination in the evenings. Tenjuan Temple’s beautiful gardens are lit up for the special night visit. Brilliant autumn colours and beautiful gardens create the fantastic scenery in the night.